Grow your favorite bell peppers year after year by saving seeds from this year's crop. 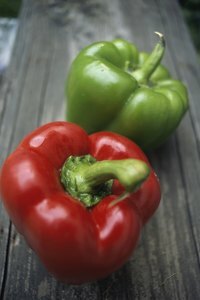 Bell peppers are easy to grow, self-pollinating and produce a plant in the same season you sow the seed. Decide what qualities you prefer in bell peppers such as size, texture and flavor. Also, consider plant characteristics, including harvest time and productivity. This will help you determine what bell pepper seed variety you wish to collect. Saving seeds from bell peppers begins with seed selection. Not all seeds will produce a desirable plant. Hybrid plants are a cross between two plant varieties, so their seed characteristics are unpredictable. The seed may be sterile or produce a weak plant. Instead, save seeds from heirloom or open-pollinated plant varieties such as California Wonder or Emerald Giant because their offspring will be similar or true to the parent plant. Look for heirloom varieties at the grocery store if you want to save seeds from store-bought produce. The two methods of drying bell pepper seeds are the wet and dry methods. The dry method requires little effort, but if you have a large number of seeds to dry, it can become time-consuming. Pull the bell pepper off the plant when the fruit is mature and the skin wrinkles. Cut off the bottom of the pepper and scrape out the seeds from around the central core. Place the seeds in a single layer on a paper towel to dry. If you have a large number of bell peppers to process, the wet method makes quick work of the task. Cut off the top of multiple bell peppers and combine the peppers with water in a blender. Blend the peppers to separate seeds from the pulp of the fruit. When done, drain off seeds and pulp from the top of the mixture and collect the seeds from the bottom for drying. Discard immature seeds, which float to the top, because they are not suitable. Lay out the seeds in a single layer on a paper towel to dry. Humidity affects drying time of seeds, but most seeds will be thoroughly dry within a few days. Check for dryness; a completely dry seed will break when folded. Put thoroughly dried seeds into sealed envelopes or glass jars. Sealed envelopes can also be stored in glass jars because each jar can hold several packets of seeds. Label the containers with the date and variety of the seeds inside. Optionally, add a small amount of silica-gel desiccant to the glass jars to absorb moisture before storing. Or wrap one or two tablespoons of fresh milk powder in facial tissues or cheesecloth and place it in the seed container. Freeze the seeds for a few days to kill existing pests and store in the refrigerator or in a cool, dry location. The University of Minnesota Extension recommends a storage temperature between 32 and 41 degrees Fahrenheit. Discard improperly dried seeds that have molded. Seeds lose their viability over time, so use stored pepper seeds within three years. Bell pepper plants grow best in warm soil so start seeds indoors two months before the last frost date. Sow the seeds 1/4 inch deep in a sterile potting mixture. Keep the seedlings moist, but not wet, with a constant soil temperature of 75 degrees Fahrenheit. When the seedlings sprout, provide five hours of strong sunlight or 12 hours of lamp light daily. Transplant seedlings to the garden when they reach 4 to 6 inches tall. Acclimate the plants to the outdoors by hardening them off for a week before planting in the garden. Lessen watering and set the plants outside in a shaded, sheltered location for a few hours daily. Increase the time outside each day.